Breezhon Stell and Jesse Ubah Dominate Winter Blitz! Jesse Ubah(left) and Breezhon Stell(right) pose for cameras after winning first place! Winter Blitz is one of the biggest if not the biggest wrestling tournaments of the season in the state of Maryland. Teams from all over the state come together usually over a two day period in competition. But on Friday, January 11, 2019, the tournament was compressed into one day due to the impending snow coming to the area. Two of our very own Jaguars dominated the tournament and were able to come away with first place finishes! Those two student-athletes were seniors Breezhon Stell in the 120lb weight class and Jesse Ubah in the 182 weight class. I was able to catch up with the outstanding student-athlete Breezhon Stell after the tournament. 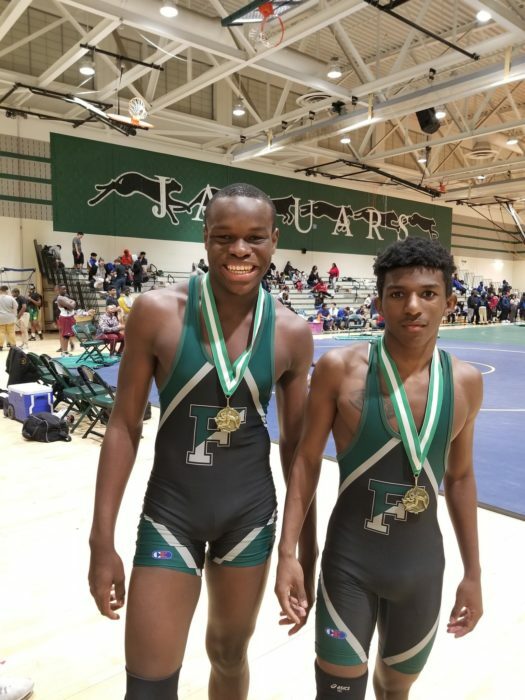 You can catch Breezhon and the rest of the Jaguars on the mat on Wendesday, January 16th, 2019 at Flowers HS taking on Wise and Frederick Douglass High schools in a tri-meet! Matches will start at 5:30pm!